Where is the Spencer Gulf? 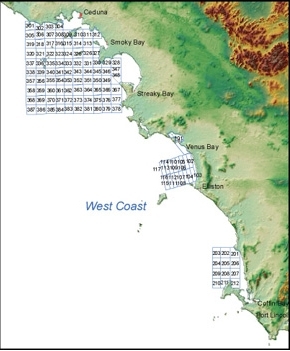 the waters of Spencer Gulf north of the geodesic from the location on Mean High WaterSprings closest to 34°59’07.15” South, 136°00’11.06” East (cape Catastrophe, Eyre Peninsula) to the location on Mean High Water Springs closest to 35°17’59.6” South, 136°52’50.1” East (Cape Spencer, Yorke Peninsula). Spencer Gulf is located in South Australia between the Eyre Peninsula on the west and Yorke Peninsula on the east. 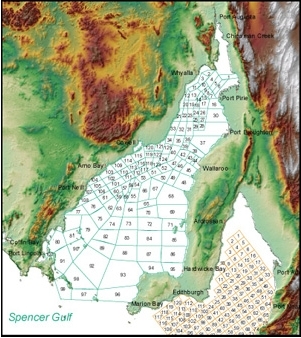 The Spencer Gulf is a unique inverse estuary, experiencing higher ambient salinity levels than typical ocean waters. This is due to the high evaporation rates during summer (December-February) and low freshwater inputs. Another unique characteristic of Spencer Gulf is that it experiences dodge tides approximately every 14 days where there is little to no tidal movement for a few days. the waters adjacent to South Australia contained within the meridians of longitude 131° East and 137° East, but does not include the waters of Spencer Gulf north of the geodesic from the location on Mean High Water Springs closest to 34°59’07.15” South, 136°00’11.06” East (Cape Catastrophe, Eyre Peninsula) to the location on Mean High Water Springs closest to 35°17’59.60” South, 136°52’50.11” East (Cape Spencer, Yorke Peninsula). The ‘West Coast’ refers to the western coastal area of Eyre Peninsula, South Australia. There are three distinct prawn fishing grounds along the West Coast, adjacent to Ceduna (in the Far West), Venus Bay, and Coffin Bay. 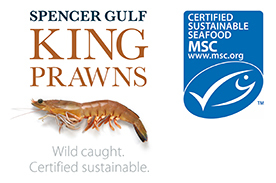 The West Coast Prawn Fishery is subject to oceanic climate conditions, so many fishing nights are lost (due to bad weather) to the fishery during a season.